Row 2 - ch3, work 1dc in each dc to end, 1dc in top of ch3. Turn. Row 4 - ch2, 1hdc in each dc to end, 1hdc in top of ch3. Fasten off. Turn. Starting with ch1, 1sc in base of ch1, work 3 rows of 1sc in each sc. 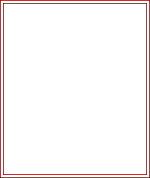 Next Row - (Inc) ch1, 1sc in base of ch1, 1sc in next sc, 2sc in each of next 2sc, 1sc in each of next 2sc. Fasten off. Roof - Join in color 2, ch1, 1sc in base of ch1, 1sc in each sc to end. Turn. Starting with ch1, 1sc in base of ch1, work one more row in sc. Fasten off. Funnel - Return to 10 un-worked hdc, skip 1hdc, join color 4 to next dc, ch1, 1sc in base of ch1, 1sc in each of next 2sc. Turn. Starting with ch1, 1sc in base of ch1, work five more rows in sc. Fasten off. Smoke - Using color 3 ch6, 2sc in 2nd ch from hook, 1sc in next ch, 3sc in next ch, working along opposite side of cast on ch and skipping last ch2, work 1sc in each of next ch2, sl st to first sc on beginning of row, ch5, 2sc in 2nd ch from hook, 3sc in next ch, working along opposite side of cast ch, 1sc in next ch, sl st to first ch on beginning of row. Fasten off. Next Row - (Inc) ch1, 2sc in base of ch1, 2sc in each sc to end, sl st to first sc on beginning of row. Fasten off. Do not fasten off at the end of the second wheel, ch5, sl st to any sc on the first wheel. Fasten off. Finishing - Weave in any loose ends of yarn, attach wheels to centre on bottom of train, attach window to driver's room just above train, attach smoke to the funnel using the ch2 made at the start of smoke. 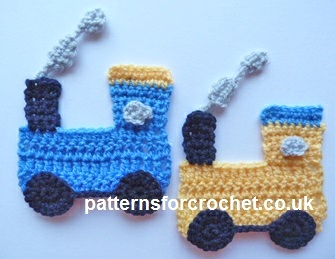 Hope you enjoy this free crochet pattern for a train motif.